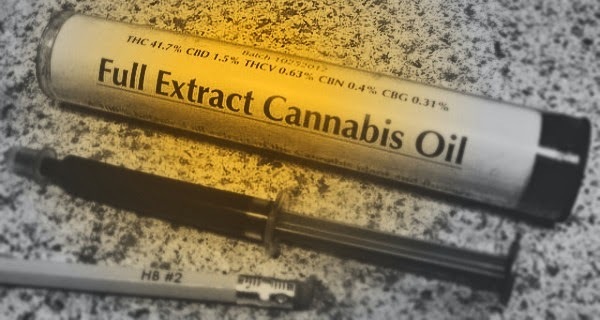 Instead of opting for chemotherapy and radiation in an attempt to shrink an inoperable brain tumor, the father of an eight-month-old baby pushed for alternative treatment with cannabis oil. The baby's physician, Dr. William Courtney, was initially skeptical early in his career about cannabis as medicine but has since seen such impressive results that he's now a staunch advocate for its use. "They were putting cannabinoid oil on the baby's pacifier twice a day, increasing the dose... And within two months there was a dramatic reduction, enough that the pediatric oncologist allowed them to go ahead with not pursuing traditional therapy," said Dr. Courtney in an interview with The Huffington Post. At four months, the tumor was completely gone. And after eight months of treatment, the brain tissue was considered completely normal. Dr. Courtney notes that the successful application of cannabis to heal means that "this child, because of that, is not going to have the long-term side effects that would come from a very high dose of chemotherapy or radiation... currently the child's being called a miracle baby, and I would have to agree that this is the perfect response that we should be insisting is frontline therapy for all children before they launch off on all medications that have horrific long term side effects." Cannabis has a wide range of reported therapeutic uses -- from cancer to asthma, as well as from neurodegenerative diseases to autoimmune disorders. Several U.S. states have recognized the beneficial healing aspects of cannabis and have therefore made it available for medicinal purposes. On the other hand, two states, Washington and Colorado, have taken this a step further and legalized cannabis for recreational use. Numerous studies support the incredible healing capacity of cannabis, especially regarding cancer. The National Cancer Institute alone has documented 25 studies on the exceptional power that cannabis possesses to halt the progression of cancer. In animal tests, two forms of liver cancer -- hepatic adenoma tumors and hepatocellular carcinoma -- decreased when cannabis was given. Benign tumors in other organs, such as the pancreas, testes, uterus and mammary and pituitary glands, were diminished as well. Several reviews also found that cannabinoids appear to encourage cancer cell death (apoptosis), while preserving normal cells. Moreover, cannabis induces programmed cell death in breast cancer cell lines and offers protection against both colorectal and lung cancer. The list of benefits could seemingly go on forever. To learn more about the wonder of cannabis, have a look at this comprehensive documentary by leading researchers and physicians in the field.